congrats!!! That ring is amazing. Do you know where he got it? I have been looking for really nice vintage rings for a while but can’t seem to find a good source. thank you thank you. i have no idea where he got it to be honest. perhaps try etsy? CONGRATS!!! I’m so happy for you guys! That ring is stunning. Oh, congratulations! I’m sure you’ll have a fantastic life together. Congratulations!!! that ring is absolutely perfect. jealous! Congratulations!!! That is one of the most gorgeous rings I have ever seen- nice one, Mr. LVP. Wish you loads of love and happiness! CONGRATULATIONS! I love love love hearing engagement stories and this one is a winner. Sounds like you had such a lovely time. And what a beautiful ring. 100 years old – that is amazing! Just think of the romance and history and the story all there in the one gorgeous ring. AMAZING! I wish you both a lifetime of love and joy. Thank you so much everyone! We’re both so happy and so excited. Alex! I gave you a Sunshine Award on my blog! 🙂 http://prideandvegudice.com/2010/06/25/862/ By the way, I don’t know if I ever said anything, but your blog design is marvelous and SO you! I have you both on twitter and honestly, the way you two were tweeting in pairs starting from Friday I thought you had just gotten married and were on your honeymoon in Portland already! Yay! I love a good surprise, and a beer drinking trip to Portland, and your ring, and just all that happiness. So, so much congratulations to both of you. 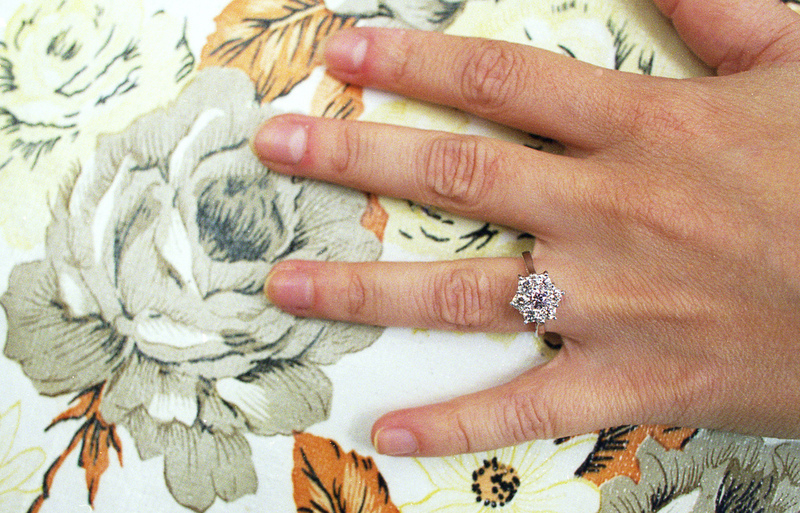 Such a lovely ring – congratulations!